Orange County offers an array of options when it comes to fourth of July events and fireworks displays. Whether you’re looking for something local, live music, food fare or fun activities for the kids, there’s something for everyone. Here are ten fun-filled Independence Day extravaganzas that the whole family can enjoy. Don’t miss one of South Orange County’s best aerial fireworks displays right here in your own back yard! Gather the family and friends, tune your radio to KSBR 88.5FM, look toward the skies over Doheny State Beach and experience this patriotic extravaganza. The fireworks are synchronized to a musical score. Bring your radio to your favorite viewing spot to listen. Avoid the traffic jams and take advantage of the FREE shuttle bus service. Shuttles will make round trips from Dana Hills High School to Dana Point Harbor from 10:00am to 11:30pm, with the last shuttle leaving the Harbor at 11:00pm. Local residents are encouraged to bike or walk to their favorite viewing spot to avoid the annual parking difficulties. Food Court, Vendor Booths, Entertainment, Fireworks, Kids Fun Zone. Fireworks begin promptly at 9 pm Free to Attend. Adults must provide a photo I.D to enter. Minors without an I.D. must be accompanied by a parent/guardian. Visitors are encouraged to bring lawn chairs and blankets. Alcohol, dogs (service dogs allowed on post), fireworks, BBQs, and motor homes are prohibited. Bring cash for parking. Free parking for military with proper I.D. 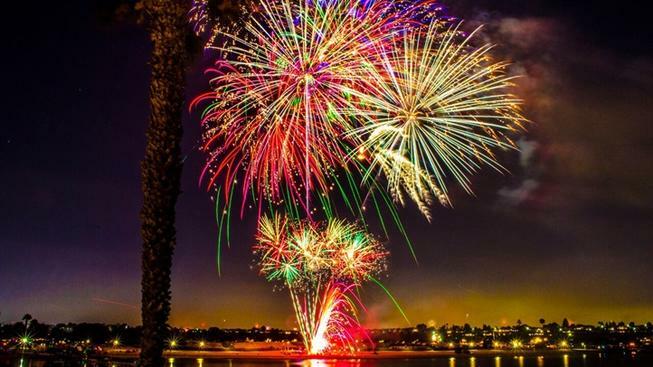 City of San Clemente hosts a Fireworks Show from the San Clemente Pier beginning at 9:00pm. The fireworks display can also be seen from many beaches and hilltop areas in and around San Clemente. There will also be game booths and live shows as well as the sparkling display from the pier. Arrive early to get the best seats. The end of the Pier, opposite the entrance, will close at noon on July 3rd for preliminary preparation and the entire Pier will close on July 4th at 8:00 a.m. For information about the SC Ocean Festival Fundraising Dinner on the Pier, call (949) 878-1273. San Clemente Trolley service will be available. The skies above Fullerton will light up with a choreographed fireworks show featuring patriotic tunes. Food, live entertainment and fireworks show. Activities include face painting, balloon art, caricature art, combo bounce house, picnic games, bungie trampoline, big kahuna slide, bungee run, fun house, delta force, robo surf and more! $2-$5 per activity. The Huntington Beach 4th of July Celebration spans three days of fun with live entertainment, exhibitors, food vendors and family activities. On Monday, the 4th, there will be a parade, Surf City 5K Run, and fireworks over the ocean at 9 pm. Check the website for specific event locations and information. Presented by the Irvine Police Association, this year’s 4th of July event will be featuring live music by the Derek Bordeaux Group, professional field entertainers, field games and activities, bounce houses, raffle with prizes, and gourmet food trucks (food available for purchase). Enjoy a pyro musical sky concert and fireworks extravaganza by pyro spectaculars. San Juan Capistrano Celebrates the 4th of July at the San Juan Sports Park, 25925 Camino Del Avion on Friday, July 3 and Saturday, July 4. The City of San Juan Capistrano and Christiansen Amusements is set to hold a two day carnival complete with thrill rides for children, teens and adults. There will be free on-site parking and shuttle service. Security will be on-site to ensure the safety of those attending the carnival. A Choreographed Fireworks Display will begin at 9:00 p.m.
No personal barbecues, pets or fireworks. Enjoy 4th of July Fireworks on the Back Bay with live entertainment. After the sun sets on a day of beachside activities, enjoy music from Wild Child, Redneck Rodeo, and Skynyrd Reloaded. They’ll set a festive tone for the fireworks display. Local food trucks will be present with a variety of tasty fare. Full bars and non-alcoholic beverages available. The Mission Viejo Activities Committee invites you to celebrate America’s birthday with a patriotic, safe and fun-filled day of food, rides, entertainment, games and merchandise booths. Please no pets, skateboards, roller blades, bicycles or barbecue grills. New volunteers are welcome to help coordinate this event and other family events in our City. Fireworks start at 9 PM. No pets, skateboards or roller blades, bicycles or barbecue grills are allowed. Celebrate 4th of July with friends and neighbors! Kick off the morning with the 31st Annual Pancake Breakfast hosted by the Laguna Niguel Chamber of Commerce in conjunction with the YMCA. Take advantage of the free swim times throughout the day (Lap Swim: 9am-12pm & Recreation Swim: 12-5pm). Kick off your evening festivities with a live concert by family Style! After the concert, walk to the Regional Park to watch the Fireworks Spectacular (3/4 mi. each way). Bring a flashlight and something to sit on in grass/dirt. Previous articleAnswer Woman: Is Sandra Hutchens O.C.’s first female sheriff?